- DNP - Departamento Nacional de Planeación, official abbreviation (National Planning Department, official website <www.dnp.gov.co>). Sources: Colombian Presidency official web site, Ministry of Interior and Justice official web site. 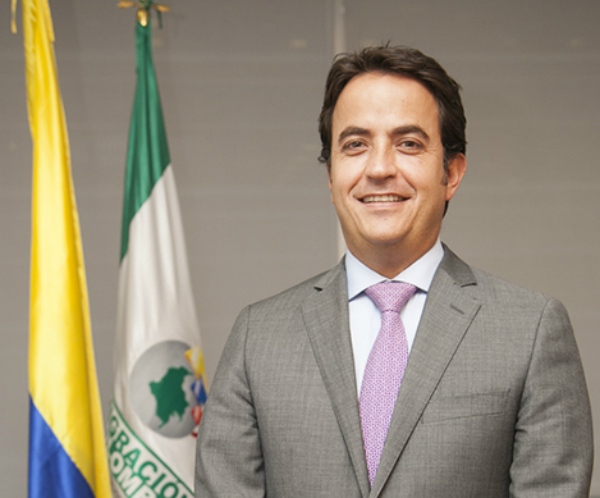 - DPS (Departamento para la Prosperidad Social, Social Prosperity Department) ( official website) (formerly "Acción Social" (Agencia Presidencial para la Acción Social y la Cooperación International). There's a new Bill recently approved by Congress that creates another Administrative Department. The Agencia Presidencial para la Acción Social y la Cooperación International (commonly known as "Acción Social") (Presidential Agency for Social Action and International Cooperation) will be established as an Administrative Department and will be in charge of taking care of the victims of the Colombian Armed conflict from 1985 onwards. Victims from previous years (1984 and backwards will only be compensated simbolically). In this new reorganization, Acción Social will be merged with the CNRR (Comisión Nacional de Reparación y Reconciliación) (National Reparation and Reconciliation Commission), in order to provide victims of the armed conflict with integral social and economic support. 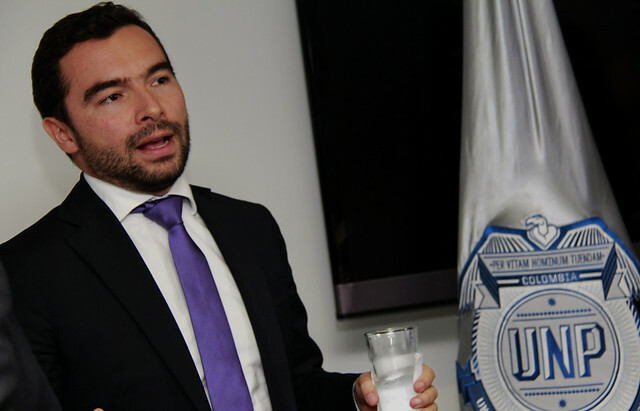 The CNRR emerged from Law Ley 975 of 2005 dubbed "Justicia y Paz" (Justice and Peace). The CNRR was established through Decree No. 4760 of 2005. Translated from <www.das.gov.co> (located by Dov Gutterman): "On rectangular shape, is formed by sky blue and white colors in two equal horizontal bands, with sky blue on top and white on bottom, the national tricolor will appear in circular 'cucarda' shape in the center of the flag." 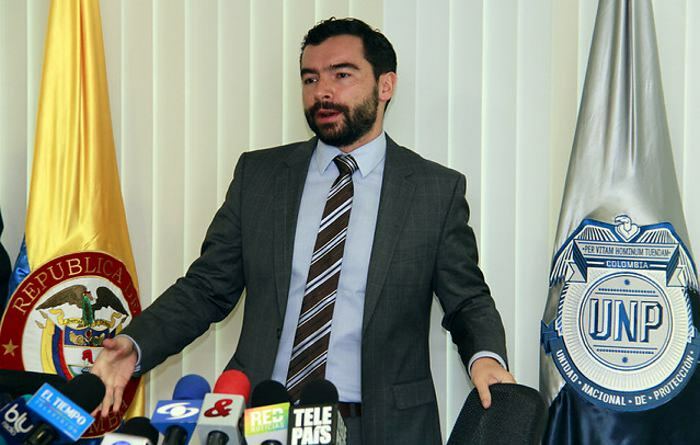 Departamento Administrativo de Seguridad (Administrative Security Department), is Colombia's secret police, in charge of home land security, immigration, emigration, bodyguards for public servants, criminal investigations, etc. 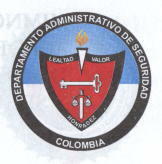 Coat of Arms of DAS (Security, Intelligence and Secret Service) is taken from the book "Himnos y Símbolos de Nuestra Colombia" , page 278. Written in 2000 by Julio Cesar García, edited by Camer Editores. ISBN 958-33-1489-7. There is an additional flag which has the same color pattern, only with the DAS Coat of Arms in the middle. The flag is a green/white/green horizontal flag, with the logo in the middle. Migration duties (immigration and emmigration) where once carried out by DAS but since January 1, 2012 they are carried out by this new gonvernment agency. 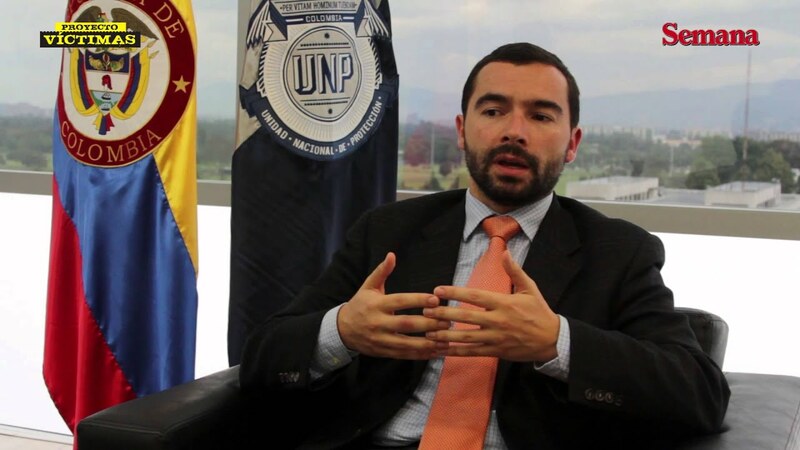 The UNP (Unidad Nacional de Protección, Protection National Unit) is an entity created to supress the DAS (regarding the tasks of protecting VIP personalities). It was created by Decree No. 4065 of 2011 and regulated by the Decree No. 4912 of 2011. It is in charge of articulating, coordinating and executing the protection service to VIP's according to the Government's designation. The flag is a grey horizontal flag with the logo in the middle, as seen in this picture (the UNP flag is on the right, and the logo is on the middle). The logo resembles a police badge with a stylized (an Andean) Condor (Vultur gryphus) on top. On top it reads in latin capital letters "PER VITAM HOMINUM TUENDAM"
I think the UNP flag is not only simple grey, but it is divided diagonally into grey and blue triangles, and logo is placed in the middle of the flag as seen here and here.